**UPDATED 3/1/19: after some reviews of the original recipe, I have retested this several times and updated the recipe. Please let me know how you like it!! Ya see that little plastic baby on top of the cake? (yes, there’s one inside of the cake as well.) 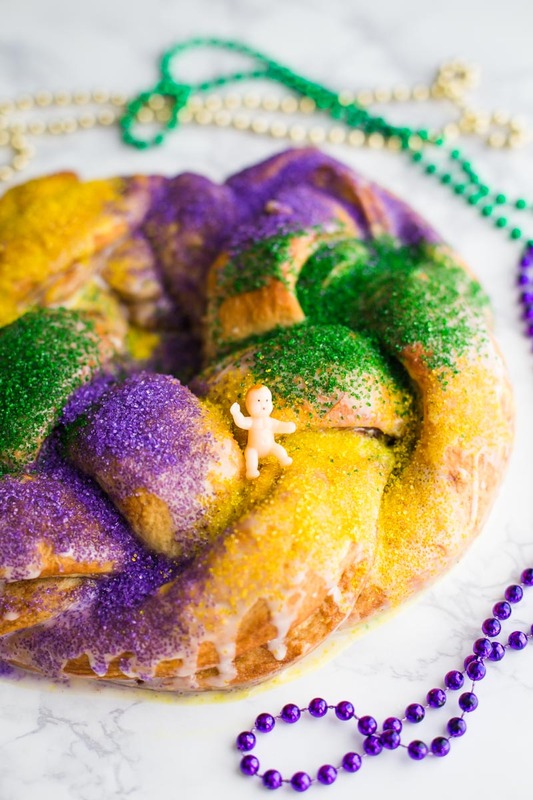 I bought those FOUR years ago with plans of baking a king cake but didn’t. Every year since then I pull those little plastic babies out of my blogging miscellaneous drawer thats currently overflowing with every color paper straw in existence, tie dye ice cream cones, and a massive collection of wooden utensils that have never once been used. That’s where the babies live. This year, I promised myself that those stinkin’ babies were going to get some use :) And, here we are! 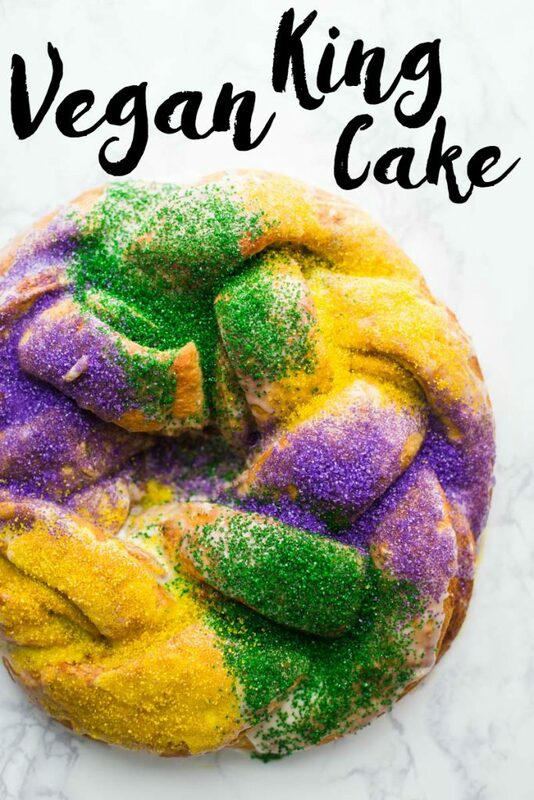 SO glad that 2017 was finally the year I baked you a King Cake. AND IT’S VEGAN!! Veganizing a King Cake was surprisingly very easy. I didn’t try anything too fancy, simply replaced the butter with Earth Balance vegan butter, the milk with almond milk, and the eggs with Bob’s Red Mill Egg replacer. Full disclosure, this is NOT a sponsored post but Bob’s Red Mill did send me the egg replacer to try. AND, it’s really pretty awesome. I can’t quite explain why or how but it seems to work a bit better than a simple chia egg (which is what I usually use). I’ve been using the one bag they sent me for what seems like forever and it’s still half full. You can find the Egg Replacer on Amazon HERE. 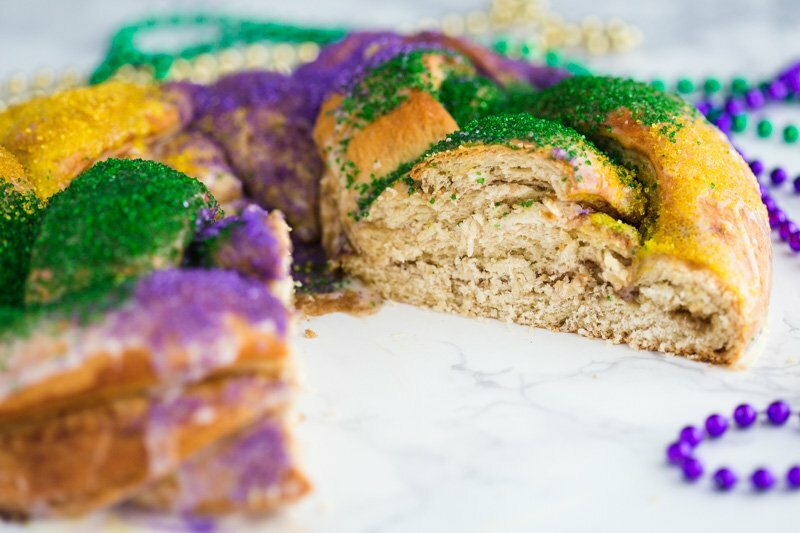 In case you’ve never made a King Cake, it’s basically a giant cinnamon roll that is often braided and covered in crazy amounts of sprinkles. 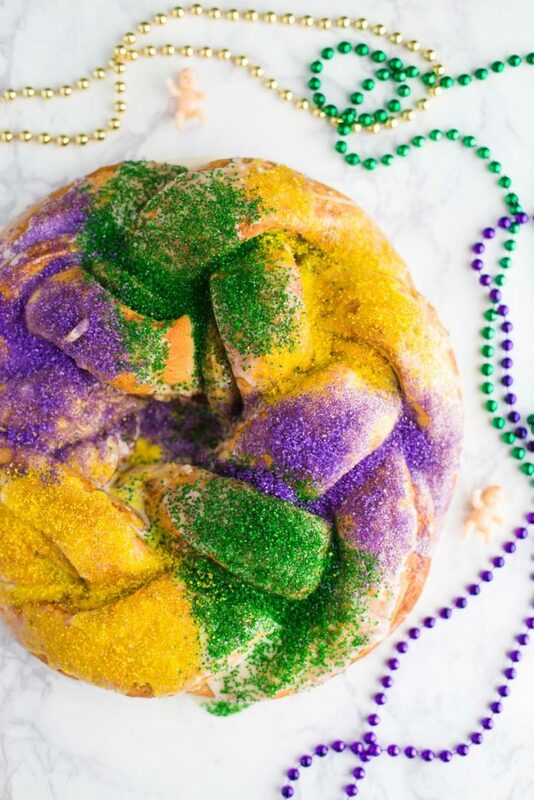 I grew up going to Catholic Schools where Mardi Gras (aka Fat Tuesday) and King Cakes were a regular part of Februaries. It only seemed natural that this recipe needed to exist in a vegan form on my blog. The cake itself is easy enough to make but does require a decent bit of waiting. What I did was make the cake the evening before and then ice/ load it with the sprinkles the next morning. It worked out perfect and is ideal if you’re taking it to work or to a party! The dough is made, kneaded, and then rested for an hour. It’s then rolled out into a rectangle and covered on one half with loads of sugar and cinnamon. Then it’s folded over, cut, braided, formed into a circle and left to rest one more time before going in the oven. After that it’s just a matter of icing it and covering it in obnoxious amounts of green, purple, and yellow sprinkles! OH and hey, don’t forget to hide the little plastic baby inside! Tradition has it that the person that gets the baby in their slice of cake has to bring/ buy/ make the next one! In a small saucepan, combine the milk and sugar. Heat over medium until the mixture just begins to bubble around the edges. You want it to be about the temperature of bath water around 100-110 degrees. Any hotter and it will ruin your yeast. Take off of heat, stir in the yeast, and set aside for 5 minutes to let the yeast activate and bubble a little. In the bowl of a stand mixer with the paddle attachment, add in 3 cups of the flour and the salt. With the mixer on low, pour the milk mixture into the flour mixture and mix until just combined. Add in the vegan egg replacers and continue to mix on low until a shaggy dough begins to form. Slowly mix in the remaining 1 cup of flour and then slowly add in the butter, about 1 tablespoon at a time. Mix until just combined. Put on the dough hook and leave the stand mixer running to knead for about 8 minutes on low speed. You can also do this with your hands if desired. Every couple of minutes, stop the mixer, taking the dough off of the hook, reposition it, and restart the kneading on low speed. Once done kneading, the dough should be elastic and neither sticky nor wet at all. 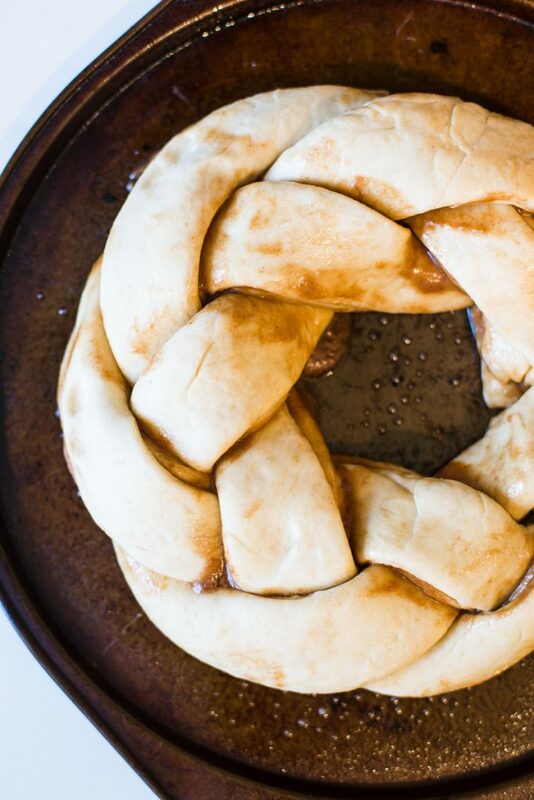 If it’s a bit sticky, add just a touch more flour in. I never need to do this step but just in case. 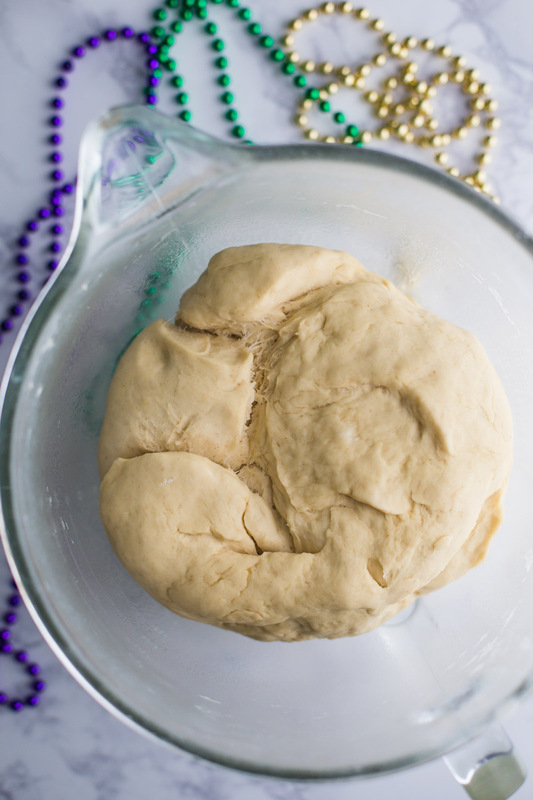 Form the dough into a ball and place it into a large, well greased bowl. Turn the dough a few times so it’s very lightly coated in oil all around. Cover bowl and let sit in a warm spot for 1 1/2 hours. It should roughly double in size. The results are a thick and rather dense dough. When the dough is nearly done rising, making the filling by simply mixing together the brown sugar, cinnamon, and vegan butter. Set aside until ready to use. Once the dough is ready, roll it out into a rectangle that is roughly 20 inches x 10 inches. Spread the cinnamon filling along half of the dough and then fold the dough over the filling (see photos above). 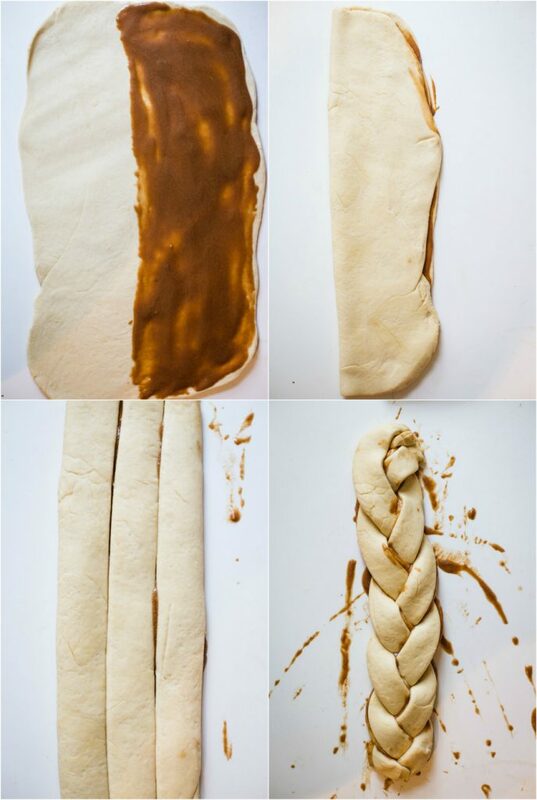 Cut dough into three long strips (again, see photo above) and braid the dough from one end to the other. Stretch the braid out a bit so that it is once again roughly 20 inches long. Wrap the braid into a circle and form the 2 ends together by pinching them to seal the circle. Transfer the cake to a well greased baking sheet (round is ideal), cover, and let rise for 45 minutes. When the cake is nearly ready to bake, pre-heat your oven to 350 degrees F. Bake for 20-25 minutes or until the outside is a nice golden brown color. Let the cake cool completely (even overnight if desired) before icing it. Once cooled, you can hide the plastic baby inside the cake by gently tucking it in from the bottom. To make the icing, simply whisk together the powdered sugar, milk, and vanilla until well combined. Pour the icing evenly over the cake using a spoon to spread it out. Finally, if desired, sprinkle the cake with the traditional green, yellow, and purple sprinkles immediately after icing it. ENJOY and Happy Mardi Gras! *Can be done in a regular mixing bowl as well although it’s more work. other notes: the filling of mine comes out a decent bit into the pan. It looks like a lot at first but there’s still a TON of filling left in the cake. I’ve been wanting to make this recipe the past year or so and finally did it last night. It was soo good! Thanks for sharing. Your recipes you post/share never fail me! Can you use gluten free flour? Also, what can you substitute for the vegan butter? My son is allergic to soy and vegan butter is soy based. This recipe looks good. 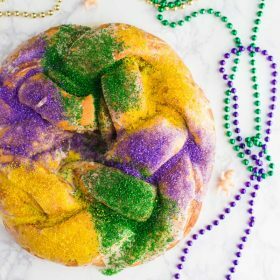 Excited to try this since my dairy and egg allergic son has never eaten king cake (and I’m from south Louisiana!) I don’t have a stand mixer though… can this be made with a hand mixer? I made this recipe last night with flax egg and it turned out awesome! I used minimalist baker’s flax egg recipe. Thanks so much for sharing this recipe! I’ve made this a couple of times now with flax eggs-works perfectly!!!! aww yay!! SO GLAD! I couldn’t find these ingredients either!